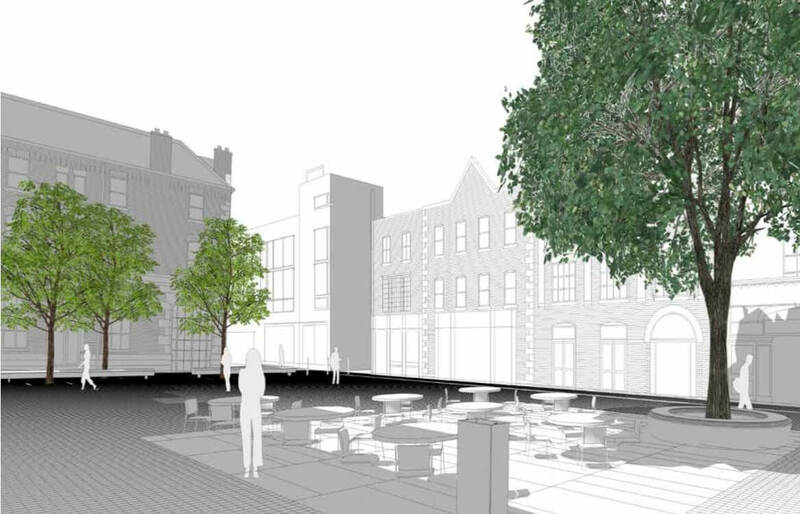 A scheme has been developed to transform the existing Temple Bar Square into a quality public realm integrated with the wider city. The concept of the design is to reconnect with the simplicity and potency of the space and expand its potential to the surrounding streets of Temple Bar, Crown Alley and Fownes Street Lower. The scope of works includes for the removal of the existing granite paving and replacement with a mixture of Leinster Granite and replacement granite slabs. Feature caternary lighting will be provided to all areas of the site (Temple Bar Square, Crown Alley and Fownes Street Lower). A drinking fountain, stone benches and trees will be provided within the main square area. Watermain infrastructure works are required to replace the existing watermain as part of the site infrastructure works. A phased programme of works will ensure that any disruption to local businesses, pedestrians and local residents will be minimal.